I finally made it to the High Line, the stretch of elevated green space that hangs over the Meatpacking District and Chelsea. Amazing what you can do with an abandoned, weed-infested train line. Aside from the awesome skyline and river views, there are two things I really like about the place. First, there's so much green. 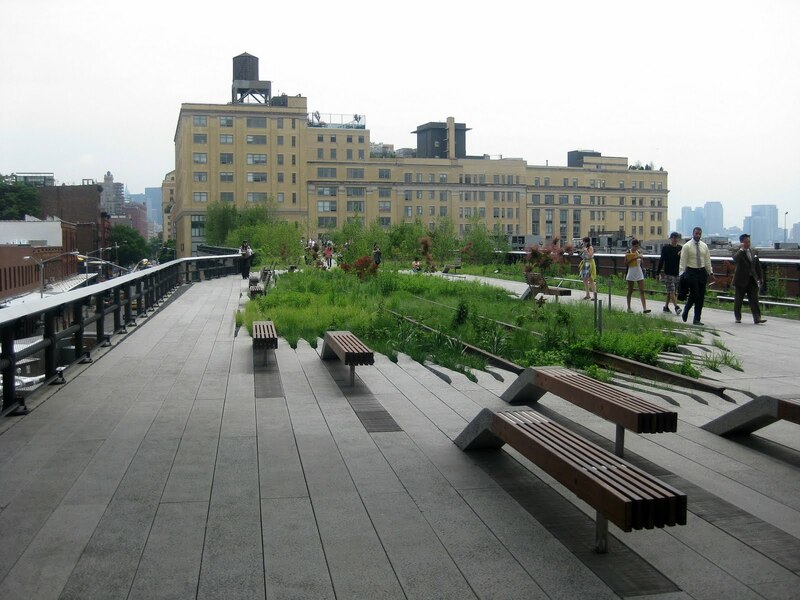 They didn't skimp on the High Line. There's a very distinct shrub vibe going on there that sets it apart from any park I've been to in the city. The lushness makes it a refreshing place to stroll. The other cool thing is how well the High Line blends into its surroundings. It slices in between and around buildings perfectly, never out of place, but never boring either. I definitely want to take the baby here soon. One of my favorite singers, Tift Merritt, who is quite successful, likes to busk on the highline.